It's now 2 years since I began my tattoo removal journey, 2 years! When I began this, I presumed it would take around 6 months for the tattoo to totally vanish. I first went to a plastic surgeon to inquire about removal in September 2015. They quoted me eight sessions (q-switched) at €120 per session which must be paid up front. I decided not to progress on that one. I knew a tattoo studio near where I used to live did removal and knew it was far cheaper. It was not until 4th January 2016 that I went to start the removal. My hope was that the tattoo would be completely gone by July 2016 for my family holiday. While reading about tattoo removal, trying to get an approximation of how long it would take the tattoo to completely vanish, I discovered another type of laser called Picosure. Picosure claimed a better overall experience with less pain, faster recovery and most importantly; faster removal. I liked the technician in the tattoo studio so stuck with him for a while but read more on the side. After my holiday, I looked into Picosure in Dublin and found a place near where I lived that did it. As far as I'm aware, this is the only place in Ireland that has Picosure. I began Picosure in August 2016. The healing time is definitely faster, the laser is definitely less painful and the removal is definitely faster. However It's now 4th January 2018 and I still have a tattoo. When I started Picossure the technician estimated 6 sessions for removal. I have had five and I definitely still have a tattoo. 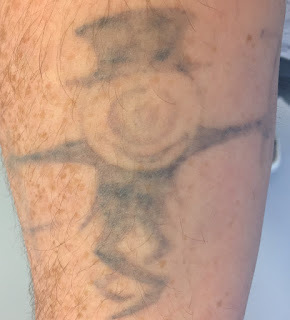 As written above, when I began the removal process I started reading about removal hoping to find how long it would take to remove a black ink tattoo. I think I expected to read 6 months to 1 year. I could not find anywhere that would give a clear and concise answer so I thought "I know, I'll start my own blog". 2 years in and I am no closer to knowing how long it will take to remove a black ink tattoo. One of my earlier thoughts, written over and over in this blog, is that I wished I had started in September 2015 and not waited until January. Obviously I don't wish I had started in the place that wanted me to give them €960, I just wish I'd gone to the tattoo studio that day / the next day and began immediately. What I have since come to realise is that starting 3 months earlier likely would not have made much difference. Sure, I might be one session further or the tattoo might be even more faded but I don't think the difference would have been significant. definitely not enough that I should have regrets. I haven't posted here in a while mostly because I've been busy and I don't have much to share. There is still definite progress in the fading but nothing hugely substantial. I am pleased with the progress but as you probably deduced from above, I would like if it were more gone than it is. I didn't take a photo before I started removal, this is the big regret of my removal journey. I think the first one I took was in March after 3 sessions. This was taken earlier today. I made this is the collage last year. The photos are from 22 March 2016, 26 June 2016 & January 2017. I thought it would be good to do the same this year. This time the photos are 22 March 2016, 4 January 2017 and 4 January 2018. You can really see the difference in the colour. There are some parts that are disappearing and it is definitely getting lighter. There are also parts which you can't really see in the photo that are close to gone. Tattoo removal is slow. It is expensive. It is questionable if it's worth it. That said, I am still pleased I am getting this removed. I just wish it wasn't taking so long. I have one more Picosure session booked. Around March last year, I really thought that it would be gone by March this year, mostly because I was happy with how it was progressing. I honestly can't say how many more sessions I'll need. I don't have a date for my next one yet but I think I'm going to try to make it early February. I'd like to get these 6 Picosure completed and see what is recommended and where to go next. I will continue with the removal process, I will keep spending money on it. I will hopefully not update this blog next year saying how confident I am there there will only be one more year of laser sessions.